I used to love negotiating over email. It's much easier than trying it in person because there's no face to speak to. Over email, there's time to formulate a response or counter offer without being put on the spot. In person, I never knew where to begin, and as soon as it got awkward, I'd get all red and start to sweat. Not exactly the best poker face. Nobody likes to get rejected, but if you never ask, the answer is always no. If you're trying to save $10 on a used iPhone you found on Craigslist, just ask! If the seller agrees, you can smile extra wide when you're making that first phone call to your mom. If the seller declines, you're right back where you started, at the original price, so there's no harm done! No seller would be so taken aback by a low offer that they would then refuse to accept the money they're looking for. The worst-case scenario really isn't so bad, so there's no harm in asking. Nobody likes to accept less than what they were hoping to get for an item. Why would they? But there's a good strategy you can employ so that the seller thinks they win while you still save money. Instead of asking for a discount, ask for some add-ons that you'll need anyway. In the iPhone example, you may be planning on buying a case and some screen protectors, so even if your first offer is declined, you can come back with this. The seller would still get all the money he wanted, and you'd get some free extras that you were going to spend money on later anyway. If you ask for a $5 discount, there's very little room for counter-offers. By asking for $20 off, even if you know the other party will reject it, there's opportunity for finding middle ground. Maybe they say they can only do $10, which is what you were going for anyway, so you'll still reach your desired outcome! Don't be afraid to go low and gauge the reaction of the seller to determine your next move. When you get nervous and talk about why it's such a great deal, you're really digging yourself into a bigger hole. You end up sounding desperate, and in a negotiation, when one side is desperate, there's little incentive to meet in the middle. After all, why lower demands if you know someone will buy at a higher price? I know wouldn't! Try silence as a negotiating tactic. There will be no penalty, and by shutting your mouth, you'll come off as cool and relaxed instead of nervous! Not every negotiation needs to be a win-lose situation. When you're negotiating, it's already clear that both parties are interested in reaching a positive outcome. So show the other party how you can both get what you want. I like to look good (can't you tell from my picture? ), so when I moved to a new city, I proposed a great situation to my barber: I'll come in more often if you chop $5 off the cost of each haircut. He gets my business and my money, and I get to look my best without burning a hole in my pocket. He agreed in a heartbeat. 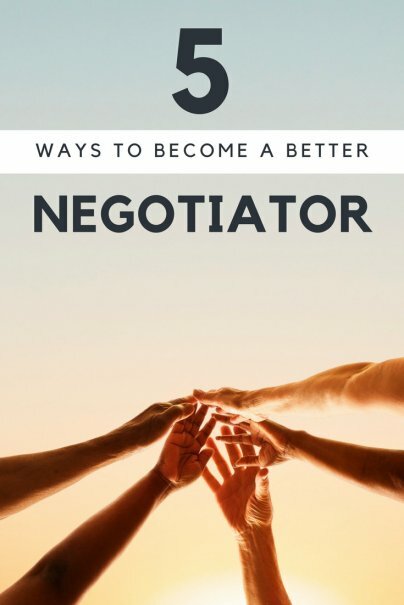 You don't need to wear a fancy suit to be a good negotiator. Find a few places to test these tactics, and let us know how they work out! I think #2 also works with negotiating for a raise. Given the economy, ask your employer for other options other than just more money, such as being able to work from home 1 day a week, extra vacation time, or a training course you've had your eye on. Potentially win-win until business improves. Some good tips here. In addition, I read a good book a while back called The Secrets of Power Negotiating by Roger something. I learned a lot from that one.